Designer Erin Harris transforms a photo of your beloved pet into a sterling silver pendant. Your special pet has always been one gem of a friend to you, so why not show them off for the special treasure they are? Designer Erin Harris makes it possible by transforming a photo of your furry or feathered friend into a custom piece of jewelry. 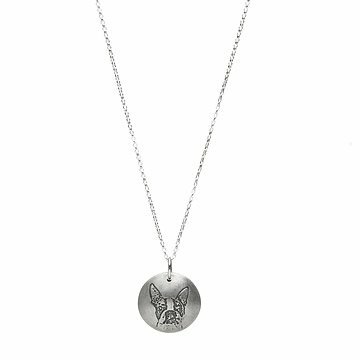 To create this personalized, sterling silver necklace, Harris works from a photograph of your pet, first transferring the image by hand onto a customized rubber stamp. That stamp is then used to emboss the image into the domed surface of the pendant. The artist then engraves your pet's image directly onto the silver. On the flat, reverse side of the pendant, Harris can imprint the animal's name, birth date, adoption date, or other meaningful phrase up to 12 characters. The result is a precious keepsake that will last a lifetime, celebrating your bond with a treasured animal. Harris also includes the rubber stamp, which you can use to personalize cards, scrapbooks and more. Handmade in Montpelier, Vermont. Polish with a dry silver polishing cloth (such as "sunsheen" cloth) Avoid liquid tarnish remover. The pendant turned out beautifully, with a fabulous engraving of my dog. I was a little worried about how it would turn out, especially given the price, but I couldn't be happier. The artist emailed me the proof ahead of time to make sure I was satisfied, the packaging was incredibly thoughtful, and the final product is worth every penny! It was a great gift for my Mom, who absolutely adores her granddog! I wanted to get for myself with my Tankers on it and I came across this and it was just perfect. The box it came in had the picture that I sent to be used and the template that was made. It was such a nice touch and the pendant is beautiful and captures Tank so well! Completely happy with purchase, my wife just thought the pendant would be flat and lighter in weight for every day wear. No worries, she is happy with it, but wanted to wear more often. The artist went to great lengths to insure that I was pleased with my product/engraving. She puts so much thought into the product, the packaging, the little extras. A forever keepsake for me! This is a beautiful piece of art this is personal and meaningful. Couldn't be happier with this. My wife loves it. Artist was more than helpful with the entire project. Would highly recommend this to everyone who is thinking about getting one. This was so lovely. The artist was very communicative and made sure I was happy with the design. The very thoughtful packaging was an added bonus. This pendant is such a unique way to remember or honor a special pet. And, it looks like my cat! The quality is fabulous and it's such a magnificent way to remember my sweet kitty and keep her memory close to my heart. Erin is a fantastic artist - and just awesome to work with - she's patient and easy to communicate with as she gets your feedback and input during the creation process. Overall attention to detail is topped off by the thoughtful packaging. Would make a treasured gift. Highly recommended!!! Erin was remarkably easy to work with. I sent her a photo of my daughter's cat and she made a beautiful rendition of it. To tell you the truth, it was so cute and life like that I will be sad to part with this beautiful piece of jewelry. When it arrived it came in a small round cardboard case which had a small opening that framed the picture that i sent her. It was a sweet touch. Additionally, she provides the casting that she made to create the pendant. She also includes a small note. I was worried that it wouldn't capture the look and spirit of the picture but it did so perfectly! Erin was great to work with. I love it and wear it almost everyday.